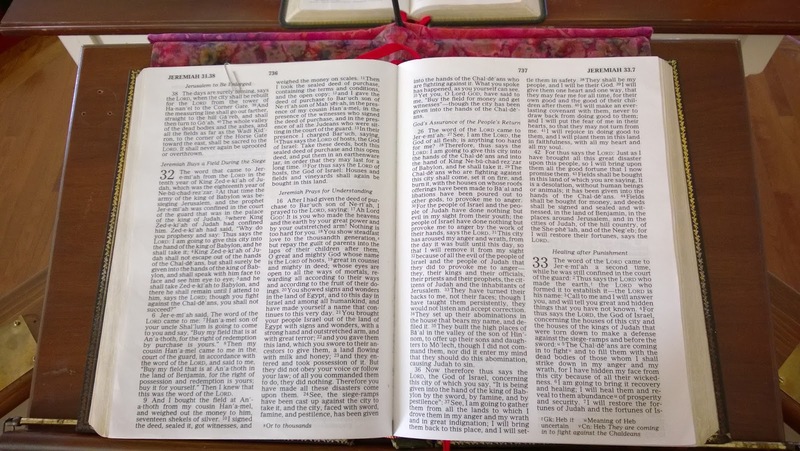 * Feature the large Bible that is used regularly in worship. Invite children to come forward to see it close up. Tell any interesting stories about it. Read and elaborate on any inscriptions in it. Explain the reasons it is carried into the sanctuary each week or is always left open in place. * If there are words that are always said before or after reading scripture in worship, practice them and discuss what they mean before using them today. If the congregation stands for one of the readings explain why. * At the very beginning of worship inform children that today we are paying special attention to how we use the Bible in worship. Give them Bible stickers to put in their printed order of worship every time they sing, pray, hear or say something from the Bible. Older children will be more diligent about putting stickers in the right places. Younger children will mainly use them to decorate their page. As they leave look at what the children have done and comment on what an important part of worship the Bible is. 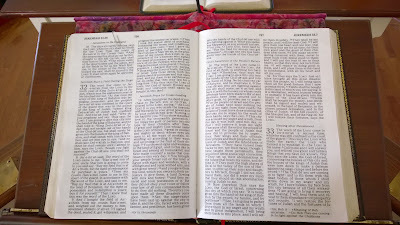 * Compare the details about the reading of scripture in the Nehemiah story, Luke’s account of Jesus reading the scripture in the synagogue, and your congregation reading scripture today. How are they alike and different? Who is there? Are they standing or sitting? How is the text explored with or interpreted for the worshipers? What they all share is that all the listeners pay close attention because they know the Word is very, very important. * Some of the traditional hymns about the Bible (e.g. “O Word of God Incarnate”) are old and therefore include words that are unfamiliar to children today. But there are others. Try singing a chorus or a verse or two of “Open My Eyes” just before reading today’s scriptures. Or, explore one of the metaphors often applied to the Bible. * Since it is Epiphany season, sing only the opening chorus of “Thy Word Is a Lamp unto My Feet” by Amy Grant, maybe several times, as you light a candle or set a lantern by the largest Bible at the front of the church. * Place a loaf of bread beside the Bible at the front of the sanctuary. Then look at the bread images in “Break Thou the Bread of Life.” Sing this short hymn just before reading the scriptures for the day. * Include the whole congregation in the reading of this story. Briefly summarize what happened then invite the church officers to come stand at the front of the sanctuary. Bring the Bible forward, open it, and read from the center. Have all worshipers stand as you read. * To avoid getting side-tracked with discussions about Law being more than just rules, introduce the word Torah. Point to the Torah books in the Table of Contents in a Bible. List the main stories in those books, e.g. God created the world, Noah’s Ark, God tells Abraham and Sarah that they are the beginning of a great family, God leads that family out slavery in Egypt across the desert to the Promised Land, God gives them the Ten Commandments, etc. Imagine not knowing any of those stories, then hearing them all at once. Then, read story in Nehemiah. * To explore the summons to joy instead of tears with older children, dig into specific things the people heard when Torah was read. Suggest that the first thing they really heard was the Ten Commandments. Imagine how it felt to hear some of them (like no stealing and honor your parents) knowing you did not keep them. It would be scary and sad. No wonder the people began to cry. Then take the role of one of the interpreters. Remind the people of the story that says God created them and said they are good. Remember that God told Abraham and Sarah that they would be the parents of a great nation and that each of the people listening was part of that nation. Insist that now that they know who they really are, they can keep God’s commandments and live more like God’s people. Finally, conclude that knowing who you are and what God wants is a reason to be happy rather than sad. * Exploring both the opening section about seeing God in creation and the second part praising God for the Law which also helps us know God is more than children can follow on one day. Given the other passages for the day, I’d be inclined to read only verses 7-14 or even verses 7-11. * No matter which translation you use, verses 7-9 verses feature seven big words that are synonyms for Law. To help children recognize these words and follow the praises of the psalmist, print each one in large letters on a separate piece of stiff paper. Read each one briefly defining it as needed and give it to a worshiper who is invited to stand at the front. Give the more complicated words to older worshipers – maybe “ordinance” goes to a lawyer – and simpler words to younger worshipers. Instruct them to raise their poster as they hear that word in the psalm. As you read the verses, pause when you come to each poster word. * Having just done a church school lesson about Jesus’ parables with a group of bright fifth and sixth graders, I have been freshly reminded that child brains do not do metaphor. They hear exactly what is said nothing more or less. So, even as familiar a metaphor as the body of Christ does not make sense without a lot of help. It helps to work on both sides of the metaphor. 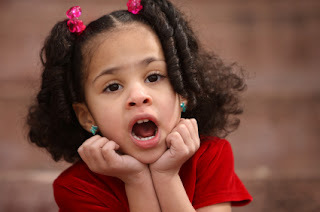 Older children slowly begin to see the connections. Younger children will at least gather information about a mystery that is obviously important to the adults. * Tell a mini story about a grandfather asking a grandchild to bring him a book, then thanking the child by saying, “Thank you for being my feet.” Invite the children to say in their own words what the grandfather was saying. Then read the phrase “You are the body of Christ” from an open Bible and together try to put that phrase into words that make sense. If you have this conversation before reading the text, encourage children to listen to the reading for what Paul is telling us about being the body of Christ. * Identify several people in the congregation who are different parts of a body. For example, the preacher and choirs are both mouths, teachers are brains (thinkers), people who deliver Meals on Wheels are legs, etc. Imagine a church without one or two of these groups to emphasize the importance of all of us working together using our different gifts. * Head, Body, Legs, by Won-Ldy Paye and Margaret H. Lippert, is an old Liberian tale about how all the parts of the human body came together. It starts with just a head which adds parts in order to do things it could not do on its own. The concise text is matched by wonderful artwork. It can be read aloud in 4 minutes. Read it just after or before reading and discussing the I Corinthians text about the interdependence of the parts of the church. * With younger children flip through Here Are My Hands, by Bill Martin Jr. and John Archambault. Each page includes a short sentence that goes “Here are my…for…” and a drawing of that part of the body doing what the words say. 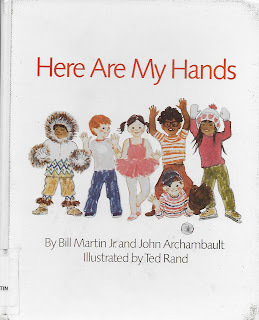 The last page is “And here is my skin that bundles me in.” As you read, point to each body part on yourself or children if they are sitting near you. Then suggest to them that the church is a lot like a body and is made up of lots of parts. Encourage them to listen to the scripture reading for what is said about how those parts belong together. That is about as far as pre-schoolers can go with this image. 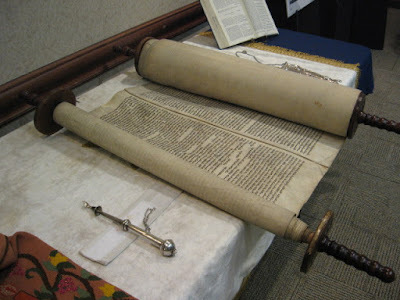 * Invite a leader from a local Temple or synagogue to bring a scroll (Isaiah if possible) to show the congregation. Interview the guest about how the scrolls are used in Jewish worship and compare it to how you use the Bible in worship. Hear the guest read (in Hebrew?) the Isaiah passage that Jesus read. Then read Luke’s story for the day. * Before reading Luke’s story, instruct worshipers to find it in their pew Bibles (give the page number to help them find it quickly J). Then have them hold a finger or marker there and find Isaiah 61:1-2 (again give them the page number). Read the Isaiah verses aloud. Then, turn back to Luke and read that story. Point out that Jesus was doing what we do. He was reading the Bible. Not only that, he was living out what he read in the Bible, i.e. he was making it come true. This could be done as the scripture is read or as part of the sermon in which you go from here to explore how Bible study shaped Jesus’ life and can shape ours. 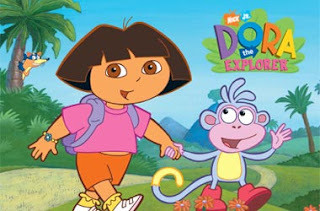 * List some heroes and heroines from books that people of different ages would recognize – Spiderman, Harry Potter, Dora the Explorer, even Star Wars, etc. Note how you would like to be like each one. Then, name one or two people from the Bible who you would like to be like. Describe ways you try to be as brave or faithful or strong as… Then, read the gospel after pointing out that Jesus also tried to live like someone he read about in the Bible. Thank God for people in books, especially people in the Bible, who show us how to live. * The tasks on Jesus’ list are at best generalities and some are metaphors. To help children understand them and claim them, match each one to something your congregation does. 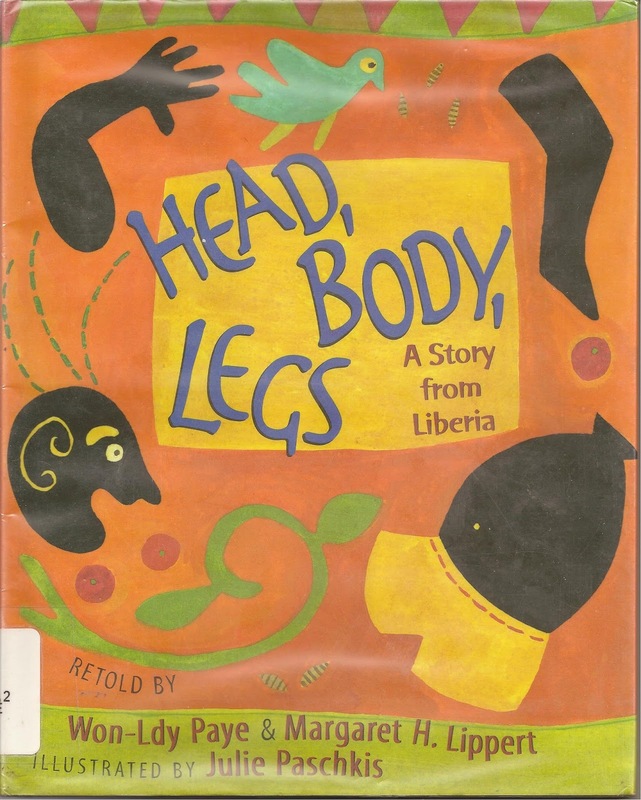 * One way to introduce this story to children is as Jesus’ answer to the question, “what will you be when you grow up?” Children frequently hear that question and are sometimes at a loss for an answer. Jesus was an adult when he went back to the synagogue where he had grown up. He knew everyone was curious about what he was doing and saying. 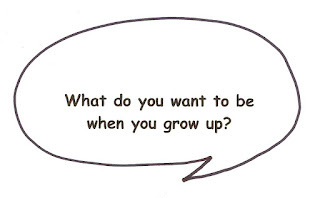 So he said, this who I am and what I want to do now that I am grown up. I realize it is too late for most people to see this, but I am thinking not so much of Jesus thinking in a child-like way, "this is what I want to do now that I am grown up," so much as Jesus imagining, in a child-like way, himself in the stories that he reads, and realizing that this is about him. In the same way it is also about the kids, who are better than adults at imagining themselves in a story, and who are also members of the Body of Christ, sent to do everything Jesus read from Isaiah, a connection the kids won't need to make, but the adults listening may be able to make because of the 1 Corinthians reading. We were using the lectionary readings from Nehemiah and Luke. My exegesis led me to see three gifts from God in these passages: the gift of the Scripture, the gift of the community of God's people, and the gift of Jesus. I took three gift bags and put a Bible, a wooden statue of the church and a cross carved with Jesus' name on it in each of the bags. The children then opened the gifts in order and we talked about these gifts from God, and how each led into the other (the Bible shows us how to live together, we live together as a church but screw up, we screw up and need the perfect love of Jesus). It was a big hit and carried over well into the regular sermon. what a great idea- thank you!